These chicken burrito bowls are a quick mix of spiced chicken, whole grains, beans, corn, tomatoes, tangy lime sour cream, and guacamole. Easy, healthy, and let’s not forget delicious. Kids are raving about them (which is sorta reason right there to try them!). 1. Scoop the avocado from the peel into a medium bowl and add the lime juice and garlic, if using. Using a fork, mash everything together until creamy yet still slightly chunky or however you like it. Season with salt and pepper and stir in the cilantro. Taste and add additional lime juice if desired. You can press plastic wrap directly onto the surface of the guacamole and refrigerate it until ready to use or up to 1 day. 2. In a small bowl, mix the sour cream with the lime zest and lime juice. Stir in the water, a little at a time, adding enough just until the sour cream is loose enough to drizzle but isn’t watery. Season with salt and pepper to taste. Cover and refrigerate the lime sour cream for up to 2 days. 3. In a small bowl, stir together the chili powder and cumin. Season the chicken thighs on both sides with salt and pepper and then evenly sprinkle them with the spice mixture, patting gently so the spices adhere to the chicken. 4. In a large cast-iron skillet over medium-high heat, warm the oil. Add the chicken and cook, turning once or twice and adjusting the heat as needed, until browned on both sides and cooked through, 7 to 10 minutes total (the internal temperature should read 165°F |74°C). Transfer the chicken to a cutting board and let it rest for a few minutes. 5. While the chicken rests, place the skillet back over medium heat and add the jalapeño and garlic. Cook, stirring, until fragrant. Add the beans, corn, and salt and pepper to taste and cook, stirring occasionally, until warmed through, 2 to 4 minutes. Remove the pan from the heat and add the tomatoes. Stir in the lime juice and the cilantro. Season with salt and pepper and toss to coat. 6. Slice or chop the chicken. Spoon the grains into bowls and arrange the chicken, bean mixture, a small pile of romaine, and a small pile of cheese on top. Spoon a generous helping of the guacamole onto each bowl, drizzle with the lime sour cream, and sprinkle with cilantro and pass the hot sauce and tortilla chips on the side. Or, for less dinner table drama, we advise you to let individuals create their own bowls. I was immediately drawn to this recipe when the author described this as a meal that their toddler enjoyed. With kids, finding a meal that pleases everyone is difficult, but this certainly was a successful and fast meal. My son told me, "This is even better than taco night," which is high praise from him. Being able to customize the fixings—sour cream, guacamole, cheese, and tortilla chips—made everyone content. For me the real star was the chicken. Who knew that a quick rub of just chili powder and cumin was enough flavor for chicken thighs? It was seasoned enough for adults and not too spicy for the kids. The warm corn and bean salad was also a surprise. The timing was accurate and the corn and beans soaked up the cooking juices from the chicken in very little time. A little lime or vinegar would have given the salad a little more acid. The jalapeno was not strong enough for me but perfect for kids. I used yellow rice as my grain. Overall, this recipe was a winner. It was an easy and fast weeknight dinner that’s perfect for families. Burrito bowls are one of my favorite easy throw-together dinners since 90% of the ingredients are usually already in the fridge or cupboard. This recipe included a few special additions like lime sour cream and warmed black bean, corn, and tomato salad to make the bowls a little more interesting. Reading through the recipe, I initially thought it was just going to be extra work, but I actually liked the additions and the flavor they brought. My boyfriend and I especially liked the pan-cooked chicken. It had a pleasingly crispy brown crust of slightly smoky spices. I will definitely make these burrito bowls again—likely doubling the recipe to have more leftovers.There was enough bean salad, sour cream, and guac for 4 servings, but 2 of us ate most of the chicken so I would make more of that next time. This recipe will go on our list of “do again and again dinners.” It would also be good for a luncheon as it makes a beautiful presentation and has several different tastes built into it. I especially liked the lime sour cream and what it did to the other ingredients. It’s easy and takes only a moderate amount of time to make and some of it can be prepared in advance to make the final work even less. It’s the kind of recipe that you could get even the most inexperienced cook to help with. I served it with brown rice. The flavor combinations are classic—spiced southwestern-flavored chicken, beans, sour cream, lime, guacamole. These work perfectly together if one likes Mexican-ish food. So the recipe can really fail only if it’s not written well or if the proportions are sloppy. Thankfully this is not the case here. 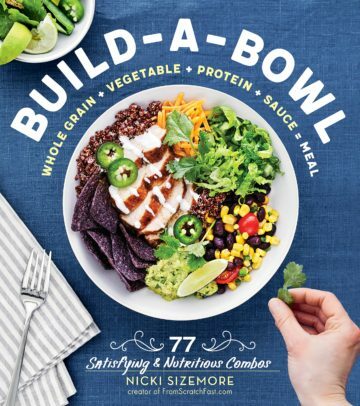 The recipe overall is clearly written and makes sense so even a novice who might be intimidated at trying their hands at one of those Chipotle-style burrito bowls at home can pull it off. Good idea is to make a larger batch of all the elements as well and have them on hand for the week where dinner or lunch can be put together in a snap. I loved the simple guacamole—just mashed avocados, garlic, lime, salt, and cilantro. Simple and delicious. I used a mixture of rice, quinoa, and farro and really liked the hearty toothsome combination. Chicken Burrito Bowl Recipe © 2018 Nicki Sizemore. Photo © 2018 Katrin Bjork. All rights reserved. All recipes and photos used with permission of the publisher.